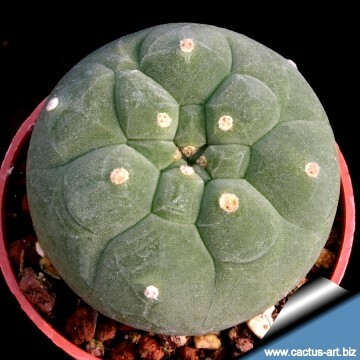 It is an attractive small globular plant with ribs resembling Lophophora, the ones that lack spines look so much like peyote that the uninformed may think they actually are. Origin and Habitat: Matucana madisoniorum occurs in an extremely single restricted area of no more than 16 km2 in the Amazonas region Peru. Altitude: It grows at elevations of about 400 metres above sea level. Habitat: It grows in dry forest. This species was once relatively common, but it is now considered rare at the original type location due to collecting and goats degrading the steep hillside while grazing and trampling. The species therefore is critically endangered. Borzicactus madisoniorum f. albiflora hort. Matucana madisoniorum f. albiflora hort. Eomatucana madisoniorum f. albiflora hort. Submatucana madisoniorum f. albiflora hort. Matucana madisoniorum var. asterium hort. Submatucana madisoniorum var. asterium hort. Submatucana madisoniorum var. horridispina hort. 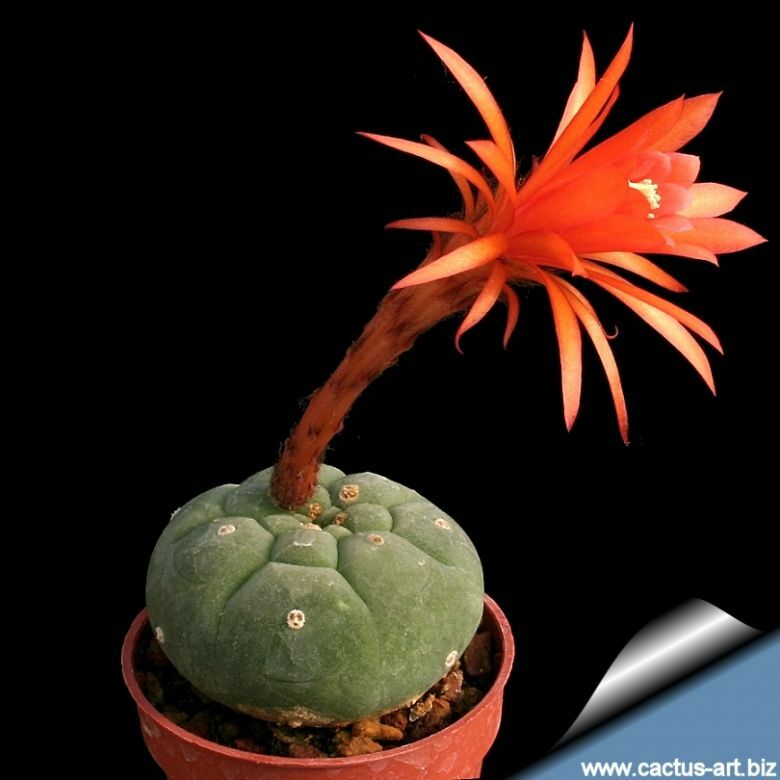 Description: Matucana madisoniorum alternately called Submatucana madisoniorum or Borzicactus madisoniorum, is an attractive small globular plant with ribs resembling Lophophora, the ones that lack spines look so much like peyote that the uninformed may think they actually are. 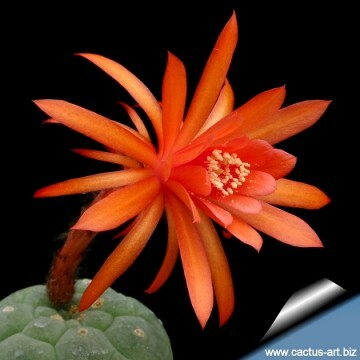 Habit: Normally solitary globose cactus that may clump with age. Stem: Flat globular to elongate with age up to 15 cm tall and 10 cm in diameter. One of most endearing feature of this plant is its unusual rough textured blue or grey-green epidermis. 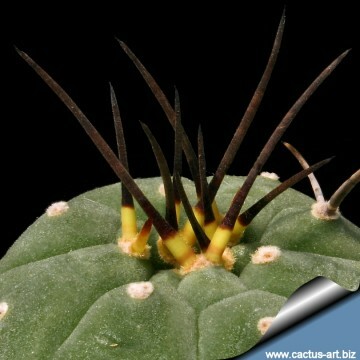 Spines: Sometimes individual plants may be almost entirely spineless, while other specimens are covered with spines or have spines missing on parts of the plant. Seedlings of this species are all densely covered with long, curving spines; however, seedlings from plants growing at lower altitudes will ordinarily lose their spines at maturity, while those from higher altitudes keep theirs, but it is very variable in this respect, and spineless plants can grow spiny offsets, or get just an occasional spine. Flowers: Forming at the apex from new areoles, zygomorphic tending to lean on one side, bright orange-red with an almost fluorescent sheen making them quite attractive, 3,5 cm in diameter, and slightly longer 5-7 (10) cm long. The buds start as little white/grey furry balls. Blooming time: Flowers more than once in several flushes throughout the summer and can flower just about all year round give the right conditions. Fruit: Dry and very fragile. 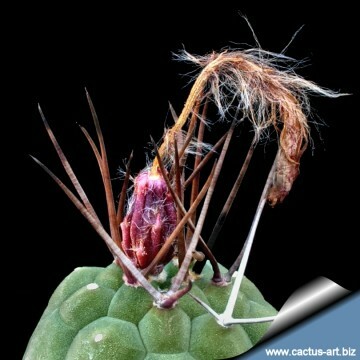 The sides eventually split open forming a cage and allowing the seeds to dribble down the side of the plant. 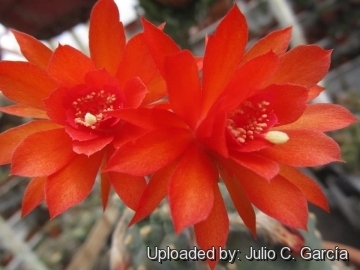 Remarks: Paul Hutchinson of the University of California Botanical Gardens discovered Matucana madisoniorum about 1963 or so in a valley in Peru. 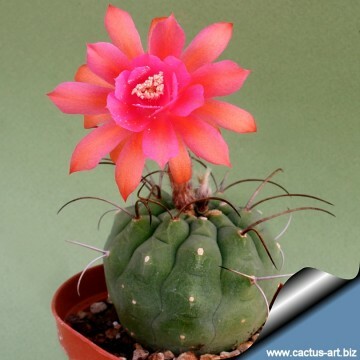 It was firstly described as a species of Borzicactus, then of Submatucana, Gordon Rowley moved this plant to Matucana in 1971, before it was briefly classified in Loxanthocereus and Eomatucana. Matucana madisoniorum (Hutchison) G.D.Rowley: has flat globular rough textured blue or grey-green stems reminding of Lophophora either entirely spineless or covered with spines. Flowers zygomorphic bright orange-red. Distribution: Peru (Amazonas). Matucana madisoniorum f. albiflora hort. : has pure white blooms. Matucana madisoniorum var. pujupatii (Donald & A.B.Lau) G.D.Rowley: has more cylindrical body, tubercled ribs, and its flowers are a very bright red. This plant also offsets quite readily. Distribution: Cajamarca (San Martin) - Peru. 5) Ostalaza, C. & Roque, J. 2013. 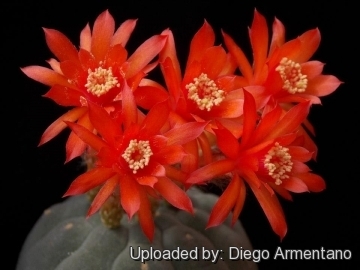 Matucana madisoniorum. In: IUCN 2013. "IUCN Red List of Threatened Species." Version 2013.1. <www.iucnredlist.org>. Downloaded on 30 October 2013. 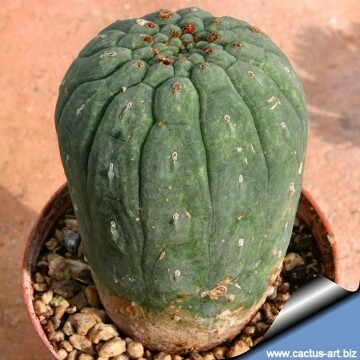 Cultivation and Propagation: Matucana madisoniorum grow slowly in their natural habitats, but in greenhouses or grafted they grow quickly with tissue that is less firm. Hardiness: Not very hard to grow if protected from freezing temperature they needs care in cultivation to reach a good size without developing unsightly marks, need a minimum temperature of 10° C, but may survive a light frost. Exposure: They benefit from a good light but not severe sunlight. Soil: Grow it in rich, porous soil. Repotting: Repot in the spring when their roots become cramped. Generally, they should be repotted every other year in order to provide fresh soil. However, this doesn't necessarily mean they'll need larger containers. After repotting, do not water for a week or more.